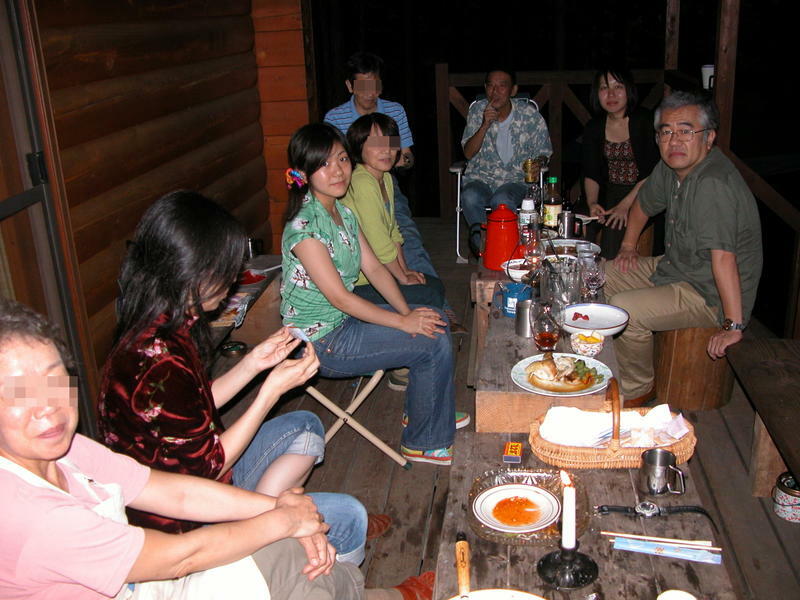 My work has been hectic these days, but I took a day-off this weekend since my family has been invited to a party which was hosted by the professor of rock science from Ehime University. Eri, A and I attended it. My wife and Yuri were eager to join the party, but they had other work. 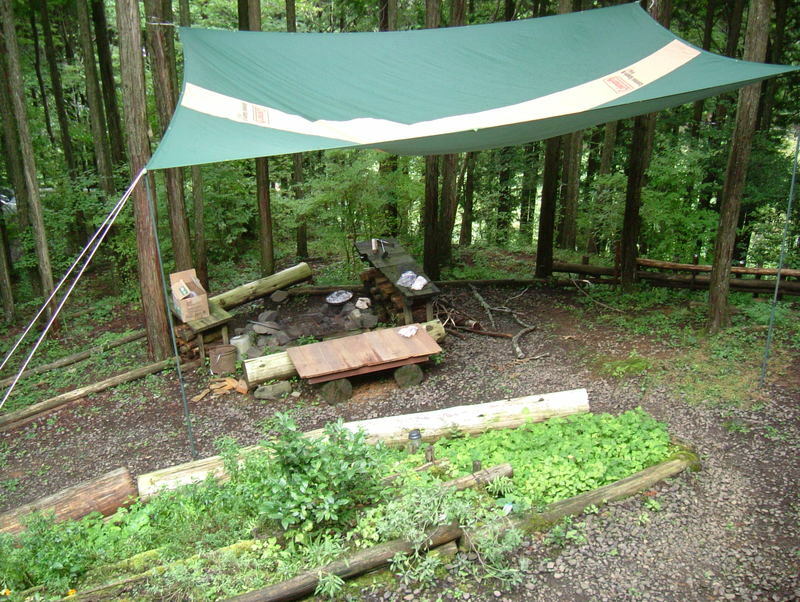 Anyway, the cottage of the professor is built in the forest of Kuma-Kogen Town, which is located just south of Matsuyama City. 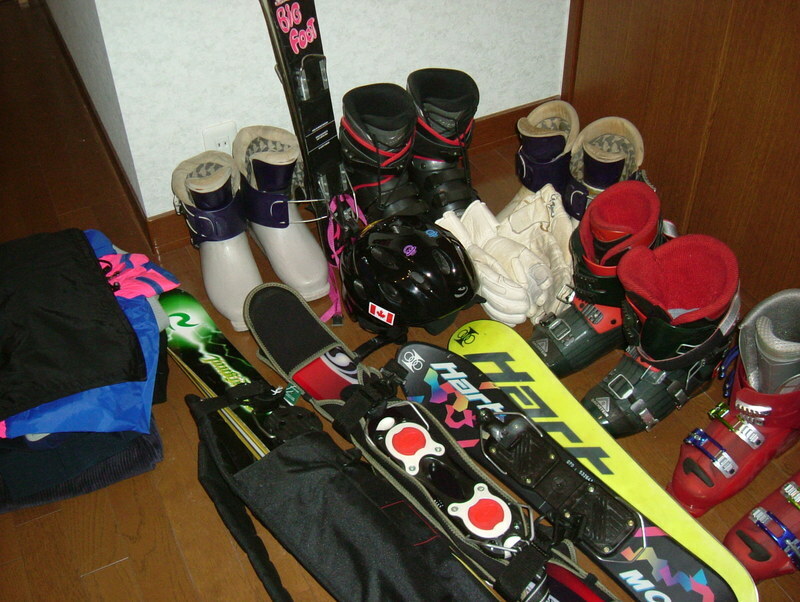 "Kogen" means highland. I visited there several times and I felt relaxed all the time. This time, it was just after a heavy rain. The dewy leaves of the trees were shining in the occasional sunbeams streaming through leaves. My eldest daughter, Eri, and my father are making toast in the picture below. Eri lives in Tokyo as a university student. She came back for this week and we had a party in a famous beer garden. She majors in Japanese language, and is going up to the postgraduate level. My father is a former primary school teacher and is interested in the language. They were talking about languages, education, and something like that, which were beyond my understanding. I felt that she's been slowly breaking away from me. Two persons on the right in the second picture are also Eri and my father. 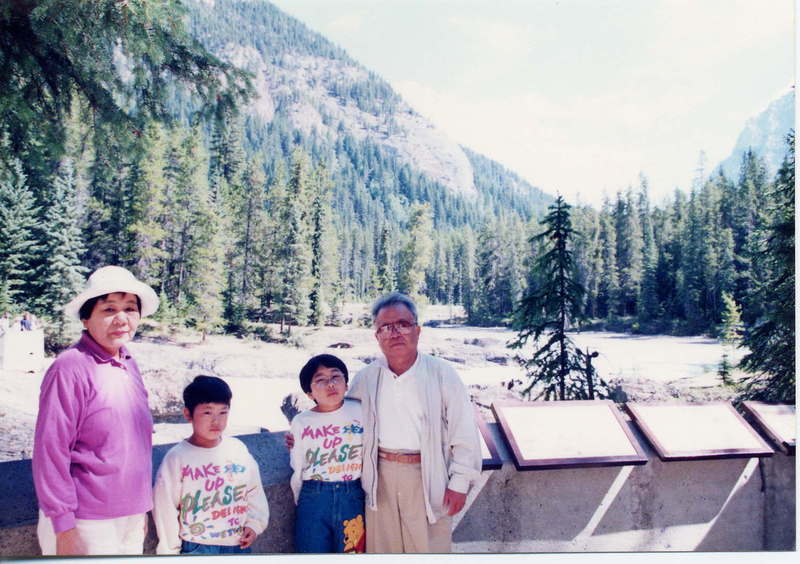 This was taken in the Natural Bridge in Yoho National Park in Canada 13 years ago. I figured out a funny fact about the Georgia conflict. Russia recognized the independence of South Ossetia and Abkhazia from Georgea. On the other hand, E.U. and the U.S. are adamantly condemning it. Understandably, Russian recognition is clearly in breach of international law. Well, how about the issue of Kosovo? The NATO alliance recognized the independence of Republic of Kosovo as well in February this year. Moscow must have thought that the independence of both breakaway regions would be permitted if the Republic of Kosovo could be independent. Russia and the NATO alliance are acting the same way. Both sides are violating international laws. We remember this fact. 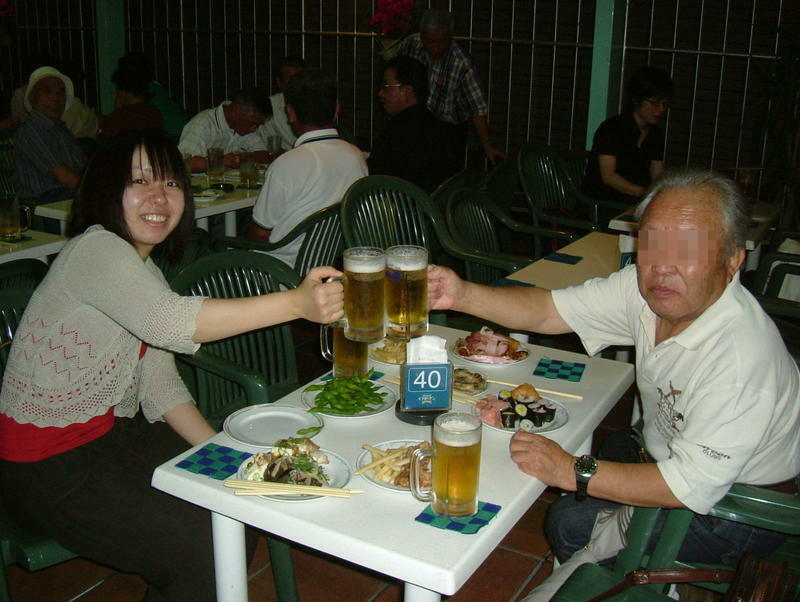 Most ordinary Japanese think that the U.S. is always good and correct. We have been taught this way for 60 years. It's about time to wake up. I saw my dog, Mocha, yawn by chance and I came up with a funny and serious idea at that time. I tried and finally made it. 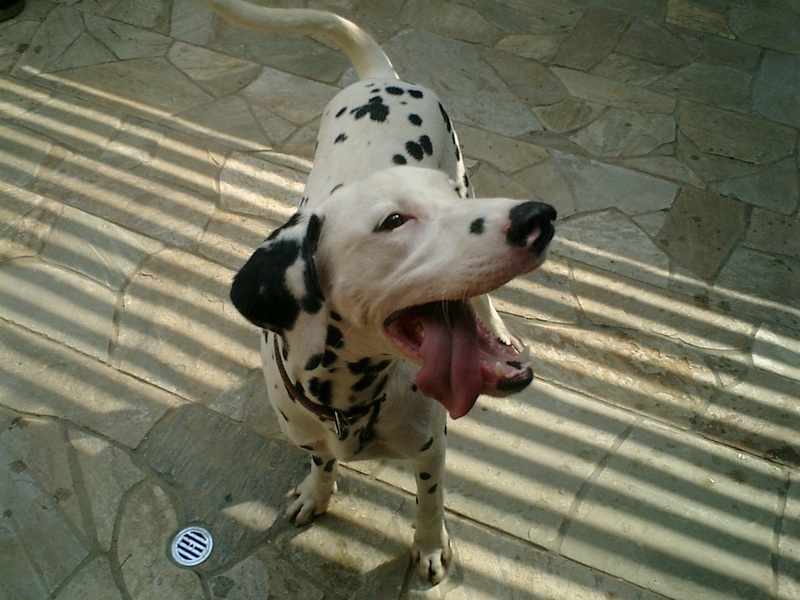 That is, , , taking a picture of his yawning. I'm showing you the picture below. Can you figure out how to make him yawn? Do you think that I was just waiting for him to yawn? If I was just waiting, it would take a lot of time. It would be impossible, as I don't have enough patience to do that. What I did was; I kept yawning again and again in front of him. I didn't think that pet dogs would find human yawns contagious, but I did it. About three minutes later, HE YAWNED!!! Mocha might be capable of empathizing with me. He has obeyed my simple orders until now, but I couldn't have imagined he would yawn after seeing me yawning. Did he catch my yawn? I've been having serious discussions these days, so I'm changing the topic this time. 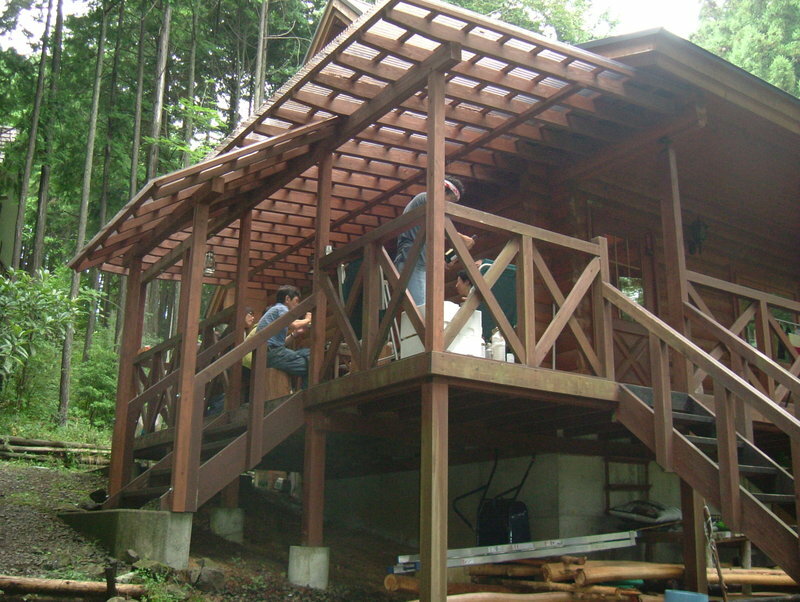 I'll show you pictures that I took in the northern island of Hokkaido a couple of years ago. 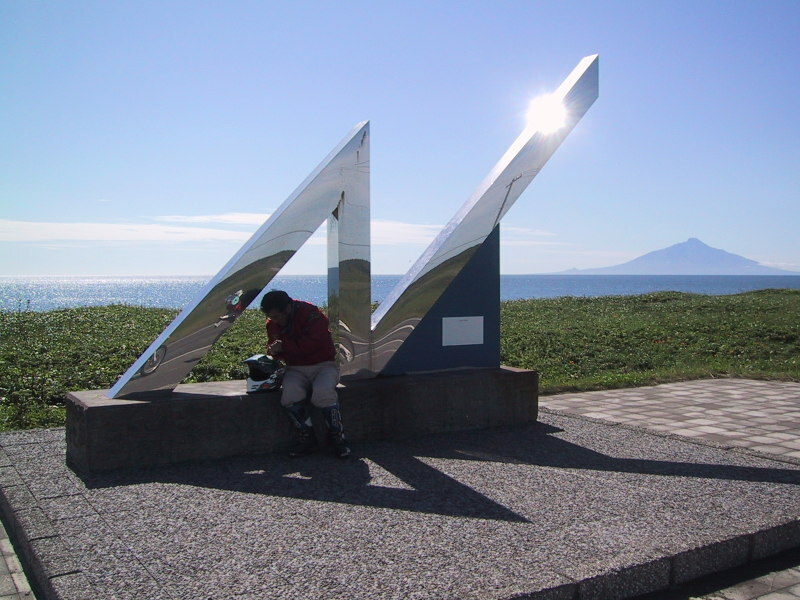 I was going up to the ultimate north of Japan on the west coast of Hokkaido, on my motorcycle at that time, when I found a monument that informs tourists of their whereabouts. I am silhouetted against the lights in front of the monument. You can also see Rishiri island behind me. The mountain at the heart of the island is called as Rishiri-Fuji, because the shape of the mountain is just like Mt. Fuji, which is also the symbol of Japan. You can easily detect the place we were on your map. 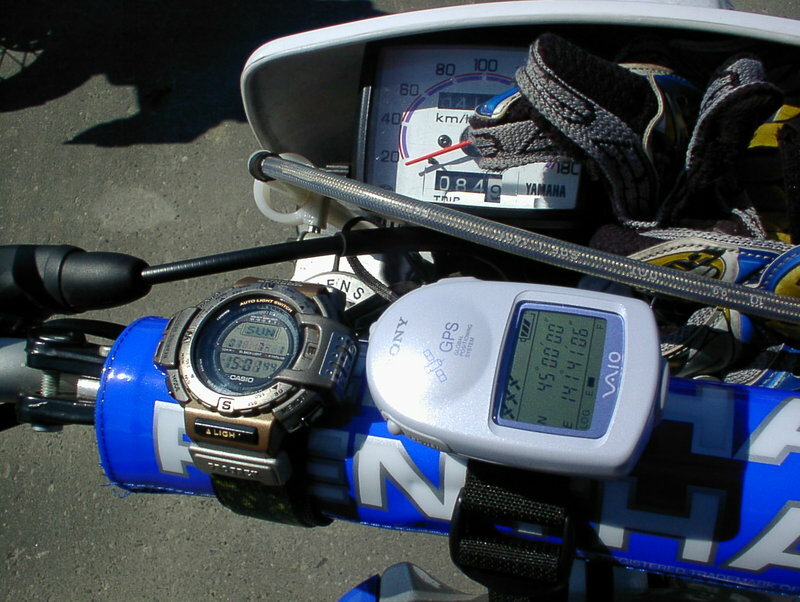 We were at the point where the northern latitude of 45 degrees' line crosses the west coast of Hokkaido. I sometimes dream of my next adventure. Viewing the Japan Sea from the opposite side, across the sea. It means that I have to stand in North Korea. It is extremely difficult in the present condition, but I hope the cruel nation will be wiped out from the earth as soon as possible for the people of North Korea. NHK stands for Japan Broadcasting Corporation. This company is the largest broadcasting company in Japan, and one of the world's leading broadcasting institutions, along with the BBC in Great Britain. NHK has been broadcasting programs favorably for China and the Beijing Olympic Games, on the air on all channels of NHK during the Games. NHK announcers were extolling the fake virtues of China. It was just like propaganda. They were screaming that this Olympic was very safe and secure with a great success at the closing ceremony. While they were praising China, ethnic minorities have been feeling the bitterness of the Chinese Communist Party and the press restraints were strict. Don't they know it? The Olympics finished without accident? It's not true. The authorities had strictly oppressed the freedom of the people. On the other hand, western medias were criticizing Chinese policies all the time. NHK didn't air this fact and closed the door to the truth. I sometimes watched the BBC. In Great Britain, the public and private sectors were denouncing Chinese move to suppress the freedom of people and abuse of human rights. The BBC officially condemned the Chinese Government and Beijing Olympic Games. I realized, and carved into my mind, that I have to keep my eyes open to the world and that NHK is a long way behind the BBC, and I have to be cautious not to be brainwashed by dominant medias. Russian troops advanced into Georgia from the breakaway regions of South Ossetia and Abkhazia when many people in the world were paying attentions to the Beijing Olympic Games, as the conflict between Russia and Georgia appears to be expanding. I wonder why Russia is hegemonic and greedy for the territory. Moscow invaded Prague just 40 years ago. People called their cruelty as the Prague Spring. Russia has also been occupying Japanese northern territory of islands over 60 years. I'd like all the people know about this occupation, and what they did at the end of the Great East Asian War. Recently, a letter came to me asking me to work as an interpreter and an emergency doctor in the Rally Japan, one of the International Rally Championship Series. I'm showing the letter below. I have been eager to watch the professional run for decades, since I was a university student. At that time, I couldn't imagine that the championship would be held in Japan because Japan is such a small country and the people aren't so open-minded when it comes to motor sports. Anyway, I might have an opportunity to talk with some famous drivers and I'm on cloud nine now. I found an interesting expression, "the idiot box", which means the T.V. Cable TV, satellite broadcasts and compucastings are getting popular, and there are a lot of channels on them 24/7. I think it is great, but it is also true that many of those channels are absurd and "for the birds." I used to have a TV in my office, but I put my TV away in the stockroom three years ago. I didn't want to waste time watching silly programs. Some of you might wonder if I never watch TV. If I want to watch a certain program, I've only to send an e-mail to my DVD recorder in my house. My recorder will faithfully record the program on DVD, and I can check it on the PC in my office later, sometimes skipping commercials, sometimes summing up. I don't remember what made me this way, but it gave me more time to do more things by throwing the TV away. Starting this blog might have been one of the reasons. I could even have enough time for reading books. Watching the TV without any special interest is just a waste of time, a portion of my lifetime, I believe. Plentiful programs will make people idiots. So the TV is called the idiot box. I'd like to clap my hands to the wit of the English speaking people. Everyone will be getting old, year by year, no matter how much they want to avoid it. I know it, but I feel sad. Aug. 15th is the War-end Anniversary in Japan. However, much to my surprise, there's no substantial reasons for it to be on this day. 1. The day of accepting the Potsdam Declaration was Aug. 14th, 1945. 2. The day that Imperial Headquarters issued an order to stop all military action was Aug. 16th, 1945. 3. The day that Japan sealed the formal capitulation was Sept. 2nd, 1945. 4. The actual end-day would be Apr. 28th, 1952, when the San Francisco Peace Treaty became effective. Aug. 15th was just the day that Emperor Hirohito declared the humiliating defeat on. GHQ led by McArthur had forced the Japanese media to broadcast or write that the Capitulation Memorial Day was Sep. 2nd. It was one of the media manipulations to implant American perception of history into the conquered nation. However, in the present, Sept. 2nd has nothing special to do with the war. The Japanese people look like having been brainwashed in many ways, but they have sticked to their ethnic resistance in very this point. Aug. 15th has been one of the special days for the Japanese over many centuries, the day for showing respect for the departed. In addition, one interesting thing is that in China and both Koreas, Aug. 15th has become the war's memorial day. I don't know why, but I guess this day must have been impressive to the people of those countries. All the people in the nation got quiet to listen to the voice of the Emperor to stop fighting immediately. Was there any other moment like this one since the beginning of recorded history? 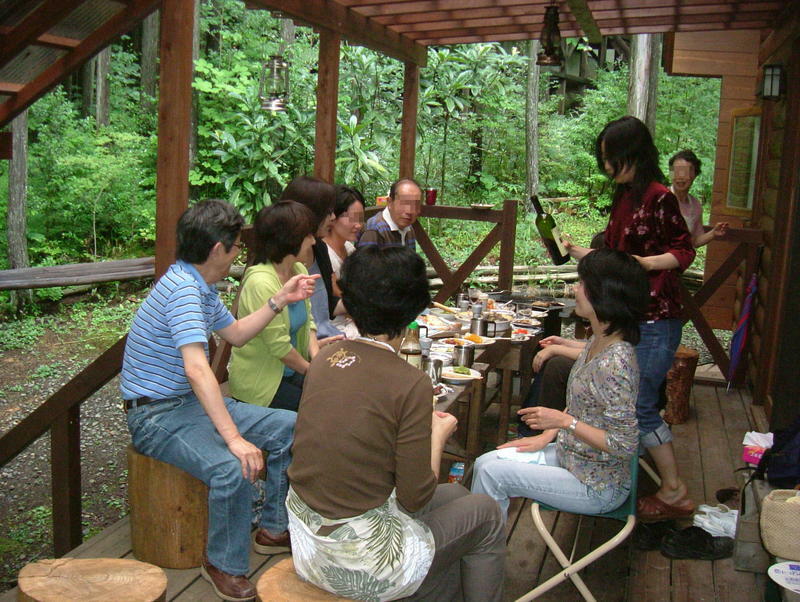 The Bon Festival is definitely one of the important annual events for most Japanese. It's related to Buddhism. The souls of the dead are supposed to be back home during this festival. People build fires at the entrance of their houses as the landmark of their houses on the first day of the festival. When I was a child, I was taught that my ancestors would come back from the dead man's land, heading for this fire. And I remember that I was scared of that story. We would spend time with all the ancestors, and rebuild fires to light the return way for their souls on the last day of the festival. At the same time, many people who have been away from their original home move back to their original or parents' house during this season. How heavy the traffic jams are would often be the topics of the daily news. They have a good time in their hometowns. As for me too, I had very happy time with my cousins. Aug. 15th is the middle day of the festival season. This day is thus important and is deeply inscribed in Japanese people's mind. One more thing I have to tell you. This day has another significance and I'm going to write about this theme in the next entry. An evening Bazaar has been held in the summer for over 20 years in my hometown. The pictures were taken on 28th June, the first day of this season. 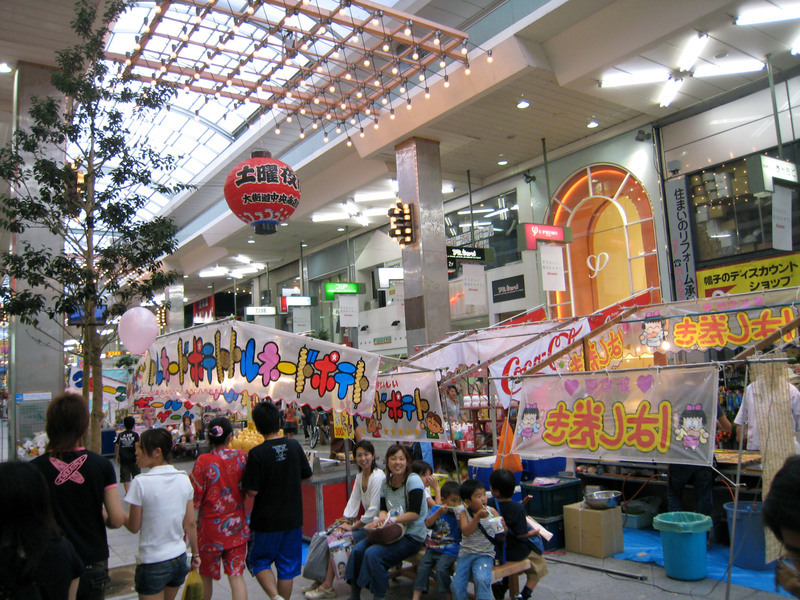 This street is the busiest shopping street in the city. 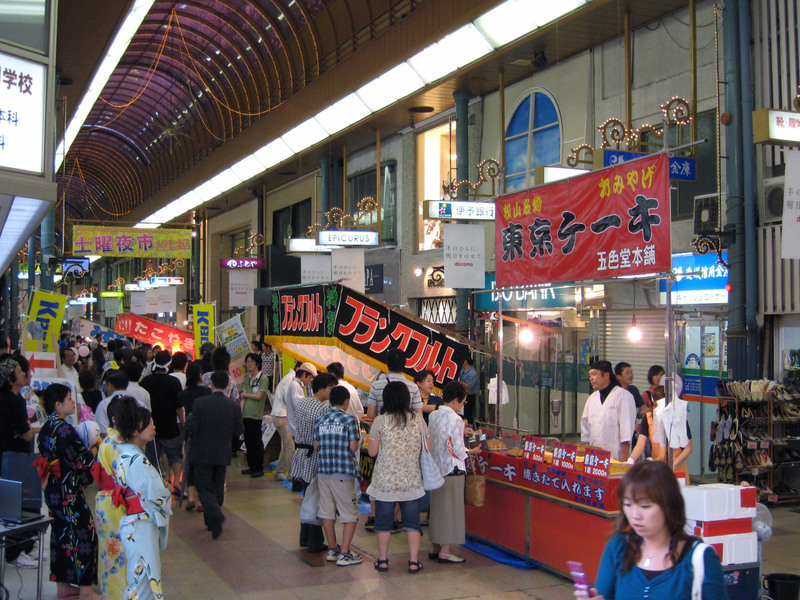 This bazaar is an opportunity to enjoy yukata, the Japanese traditional outfit in the summer. You can see some girls dressed fashionably in the picture. They look pretty, but they have to pay attention not to get their yukata stained by food or in the lavatory. It's not cheap to wash yukata. Moreover, they have to walk slowly so as not to ruin their looks in their yukata. It sounds like it's not easy to enjoy yukata. My hometown is on the coast of the Seto Inland Sea. This sea is usually calm and beautiful. Today was really fine and I went out for a change on my scooter. 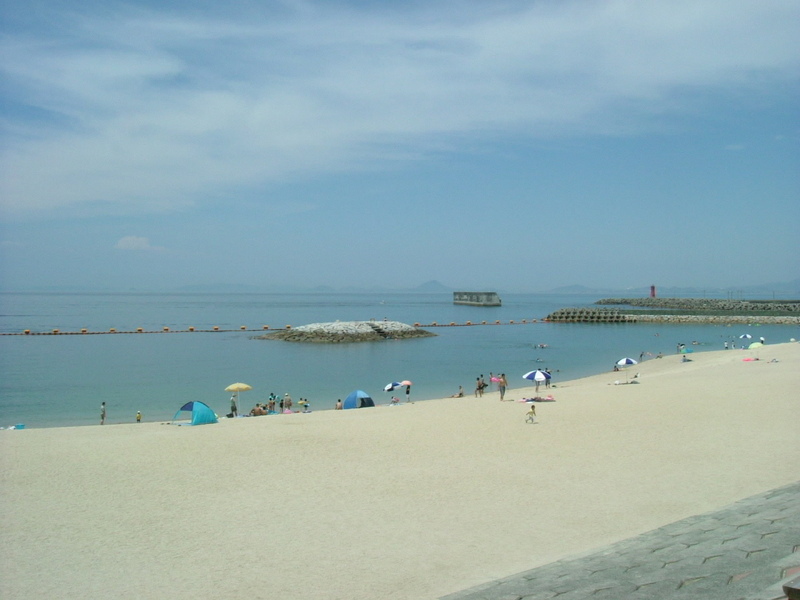 The picture shows Futami Beach, one hour's ride from my house, which is famous for its beautiful sunsets. It was just starting to get crowded and I saw some families with little kids on the edge of the surf. The scene reminded me of my daughters' younger days. When my daughters were little kids, I sometimes went there and stayed almost half a day. It took a lot out of me, but it was fun. Some of, or all of my daughters, would leave home with their partners in at least 10 years. I'm thinking about family trips that all the family could enjoy. One would be in winter and the other in summer. I got two days off this week. It was only two days, but I felt lucky to have them. I have been on the go these days. My work has been really hectic. Next Thursday and Friday will be holidays. Now I wonder what I'll do. Driving into the country, seeing what pops up around the next bend, is one of my hobbies though. Thinking of the high price of gasoline, it's not a good idea. How about caring for my garden? It's extraordinarily hot. Off the top of my head,,, nothing! I decided to play it by ear. If one of my family wanted to go out, it would be ok. A movie? it would be ok. Shopping? It would be ok. Anyway, I'm fixing to have no advanced schedule. I didn't know that such a thing could be done. That is, a single computer can control plural screens at the same time as in the picture below. I found the article about the adaptor to add one more screen to the computer; up to 16 screens. You can see the same view on a different screen at up to 16 different places, and besides, if you want you can use the screens as a single big screen. I ordered this adaptor immediately and have used it for over two months. I'm writing about my feelings. When I write blog entries I use both screens. The left side one shows the text on the editor and the right one is for quick reference. When I feel uneasy about the usage of words or phrases I directly google those on the right screen. I can easily check how those words are used among native speakers. This double screens system (I named it) is very convenient. 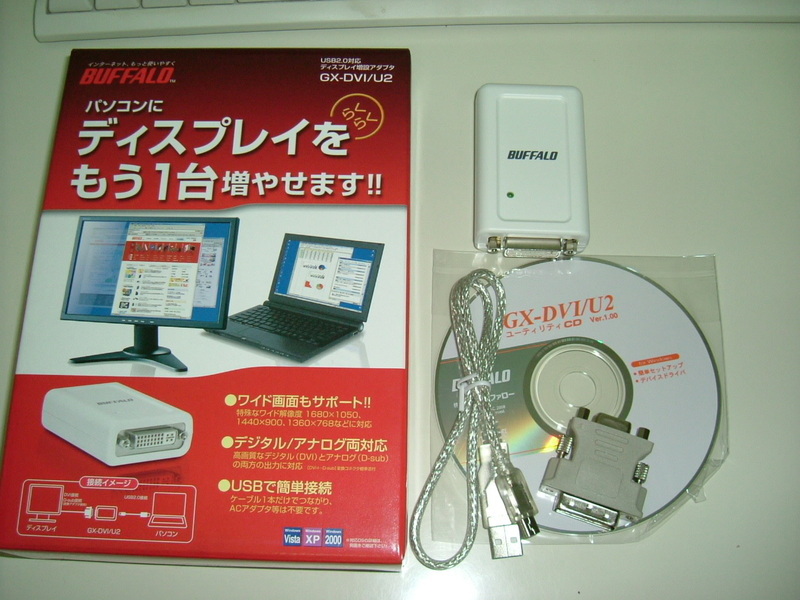 I can also launch other softwares, like iTune for music, an e-mail program, a DVD player and so on. 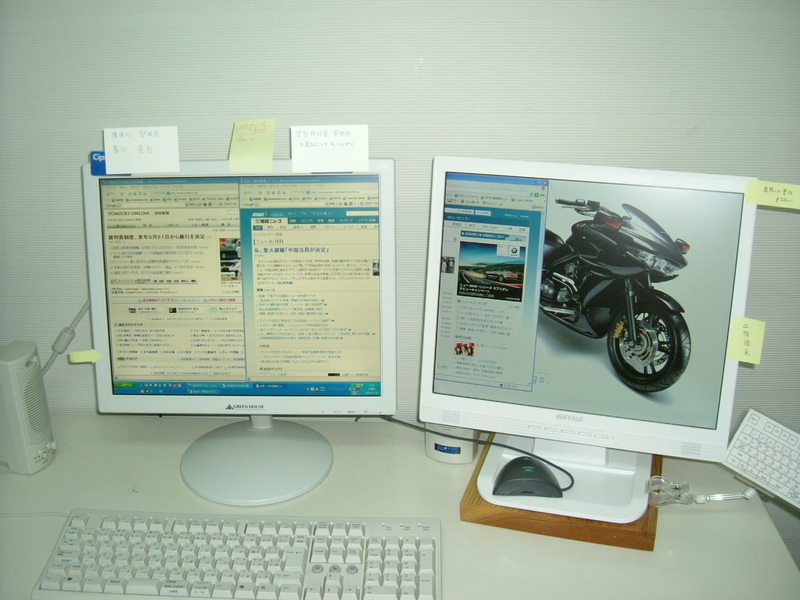 Two almost square 17-inch screens change into one rectangular screen with the horizontal length doubled. In the picture below, I'm dragging the internet explorer and its window straddles both screens. Don't you think it is wonderful? The genocide Olympics is about to begin. Previously I liked to see some events on TV and thought highly of the athletes who were chosen as the representatives of their own countries, but in this Olympics I feel a kind of disappointment for the athletes. They are just like supporters of the Chinese communist party, and it means that they are causing tons of suffering to people, not only inside China but all over the world. It is well known that the Chinese government are selling weapons everywhere on the globe to get oil, gas, and mineral resources. China doesn't deserve to be hosting the Olympic Games. The day, Aug 6th, came along this year too. Do you know what this day means. I'd like to make human beings be stamped with this day. On this day 63 years ago, the cruelest bomb in human history was dropped by the U.S. The U.S. Government has never apologized for that. Besides, they have been claiming that the Japanese were evil and the U.S. was just, and the Japanese deserved the atomic bombs. Almost all of you would be surprised, but their opinions were taken as being correct in Japan. I was also educated like the U.S. wanted. In other words, I have been brainwashed by the education system established by the U.S. However, many Japanese can now obtain any kind of information freely in the internet age. Washington's delusive remarks are revealing their true character bit by bit.